What usually comes to mind when you hear the word ticket? Some would refer to it as the sheet of paper that a person presents to a booth or an assigned personnel before being allowed to enter a movie theater. For others, the first thing that they can think of when it comes to tickets are those issued by a traffic enforcer or police officer when they catch a person committing a traffic violation. 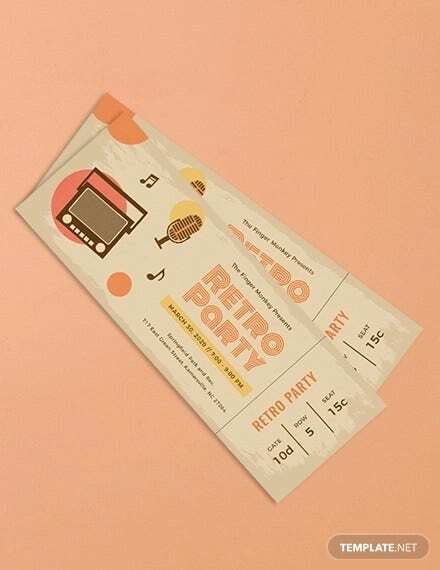 You can also read vintage ticket templates. While both are correct, we are actually leaning more towards the tickets that are being used during events. 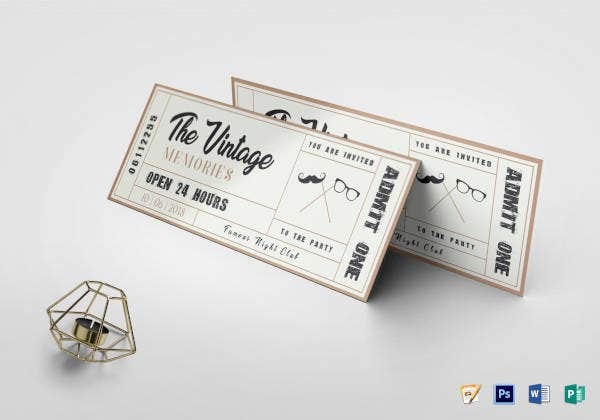 In this article, we have gathered various ticket designs and templates that can be downloaded from our website, and all these templates come in a vintage theme. 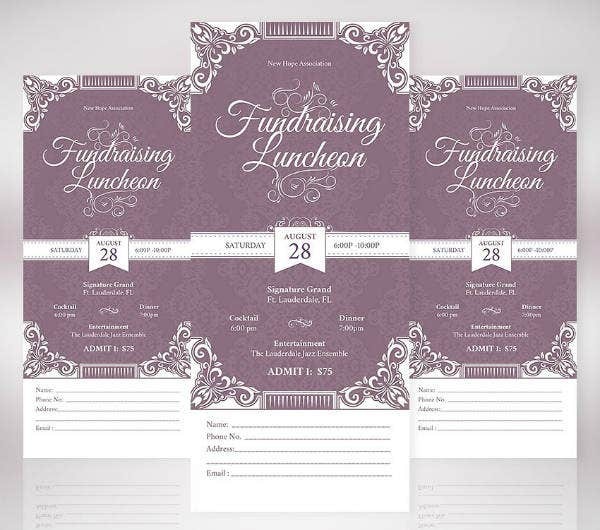 Many of the templates below may seem to be designed for a specific purpose, but they are actually fully editable, allowing you to use them for any type of event. 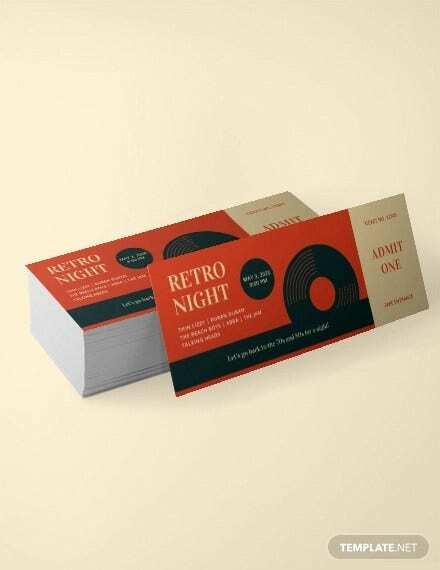 There are over ten vintage ticket templates offered in this article, with each one just as relevant and creative as the others. If you wish to see the free ticket templates yourselves, feel free to scroll down. At the end of this article, we will also be providing you with a guide on how you can download and use any of these templates, so be sure not to miss that part especially if you’re new to using templates. 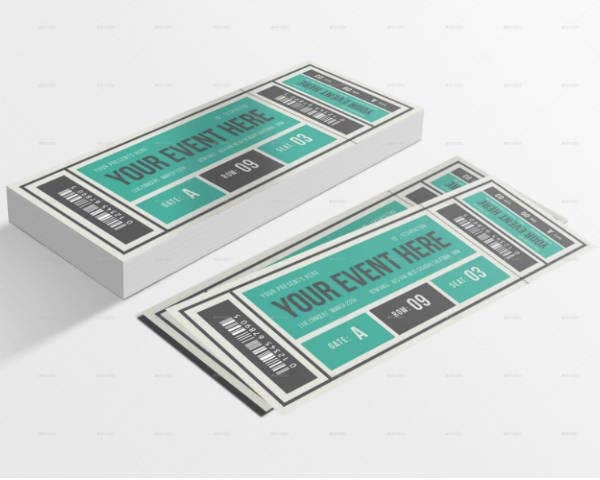 A ticket is a type of voucher that is commonly used to indicate that an individual is entitled to participate or enter the premises where an event is held. Tickets are used to admit individuals to a movie theater, tourist spot, or theme park, or to admit them to take a commuting service such as buses, trains, or airlines. Tickets are issued after the individual pays for them, though there are also tickets that are given out for free. You can also like best travel ticket templates. 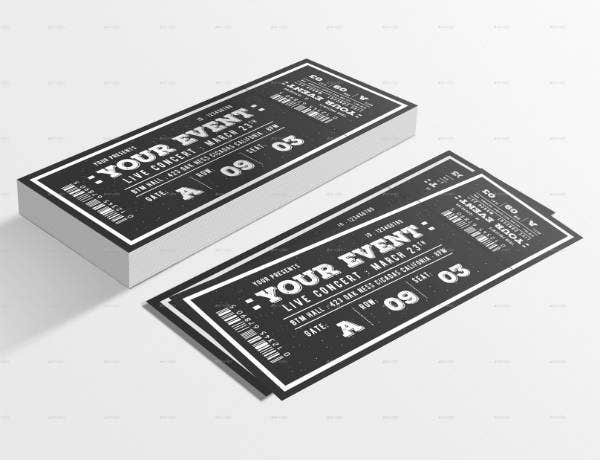 An event ticket is type that is issued either by ticket booths or the event organizers themselves to entitle an individual to attend an event such as concerts, sports events, conferences, etc. 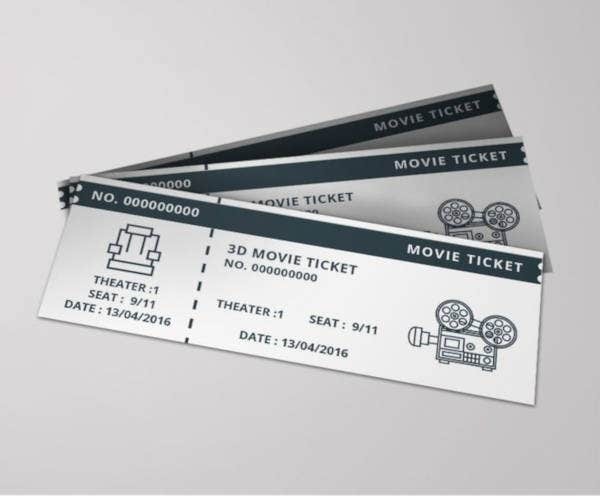 A type of ticket that is somewhat similar to event tickets, but these are specifically used to permit an individual to enter a movie theater and watch a movie screening. Movie tickets commonly bear the movie title, date, and the time that the ticket is valid for. 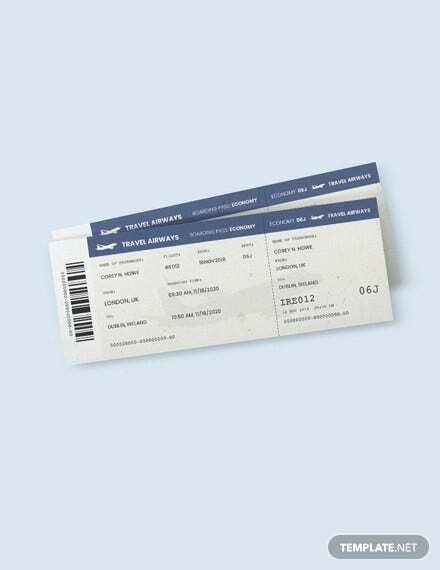 Also known as a travel ticket, it is a type of ticket issued by airline companies or travel booking agencies that entitles an individual a seat on an airline flight. An airline ticket commonly bears the name of the purchasing passenger, the issuing airline, the ticket number, the flight that the ticket is valid for, the baggage allowance, the dates that the ticket is valid for, the fare, and the taxes applied. 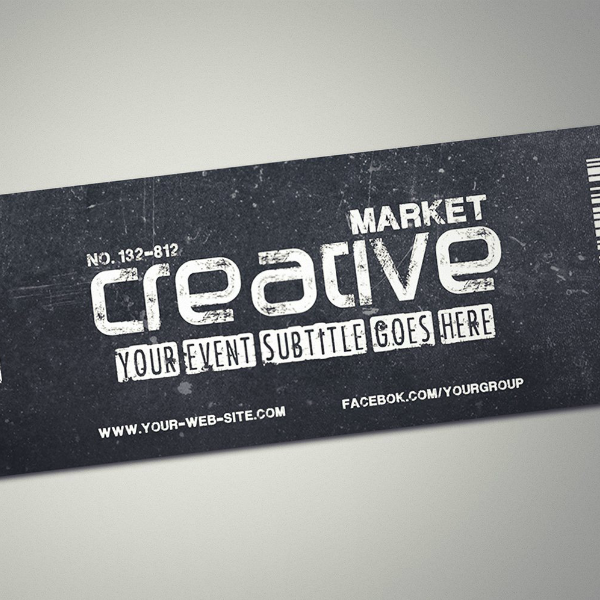 Also known as an e-ticket, this is basically the digital or paperless equivalent of a paper ticket. Many airline tickets are electronic, though they are also commonly used in the entertainment industry. Today, the e-ticket system has been considered to be a more efficient method of ticket entry, processing, and marketing. 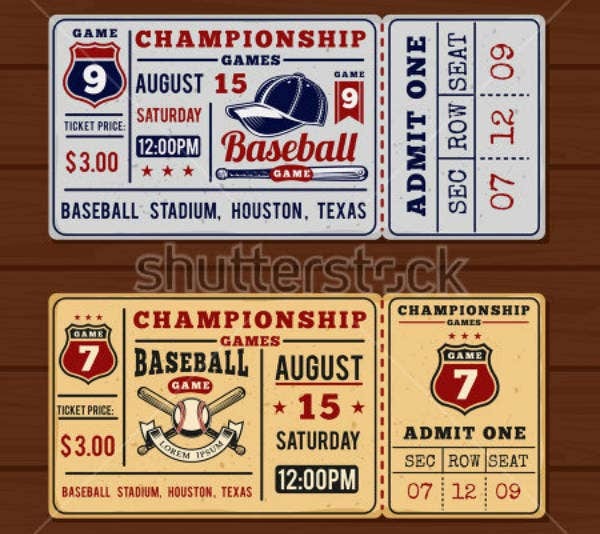 You can also like baseball ticket templates. 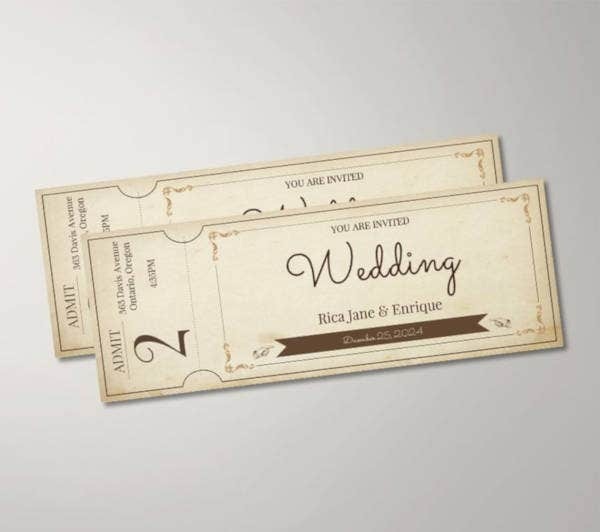 A type of ticket that is used as a form of gambling and involves the drawing of numbers in order to win a prize. In some countries, lottery is considered to be illegal, while others also allow them to the extent that they are being supported by the government. 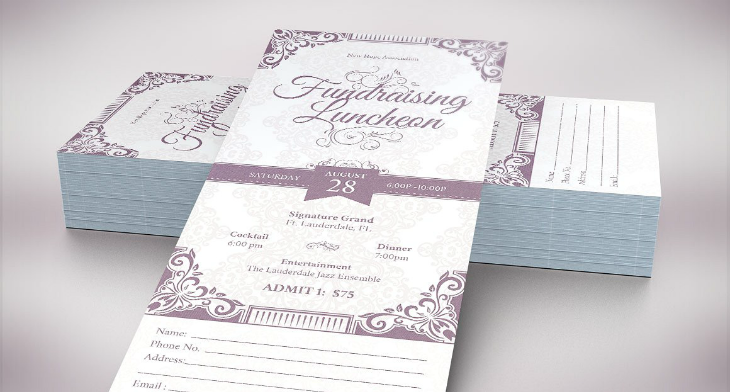 You may also see raffle and movie ticket templates. A parking ticket that serves as a receipt confirming that a fee was paid by an individual to allow them to park their vehicle on a parking spot. This is probably the only type of ticket that nobody ever wants to have. Traffic tickets are issued by traffic or police officers to individuals who have been caught violating traffic rules. 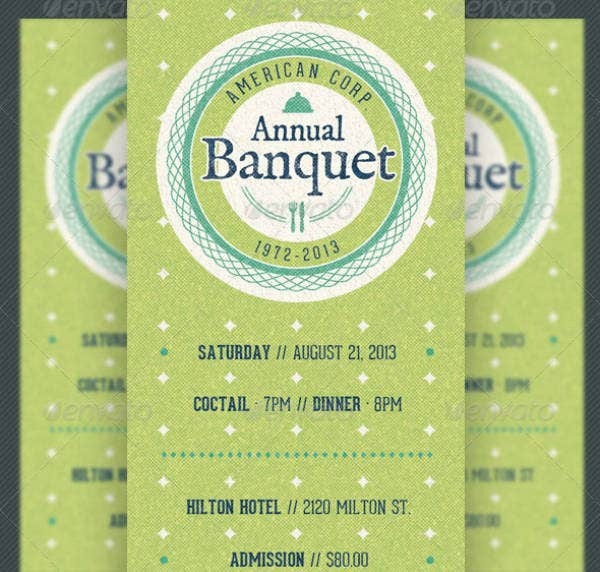 You may also like banquet ticket templates. In terms of styles, themes, or designs, vintage refers to something that represent an earlier period of time. Some would say that something around fifteen years old is vintage, though others would also say that it has to be at least twenty years old for it to be considered vintage. The term is often confused with both retro and antique, which is the main reason why we are discussing the difference between these three terms, in order to make things clear. 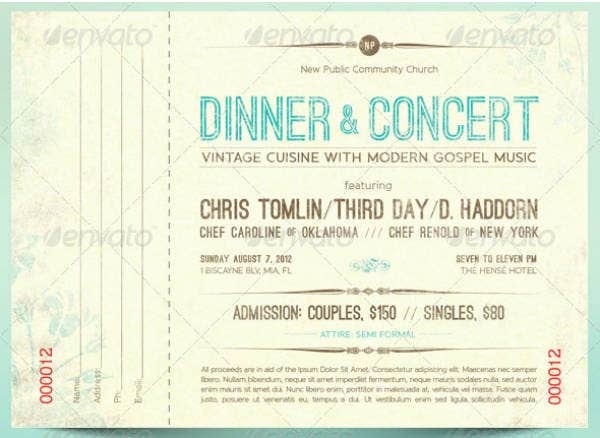 You may also see meal ticket templates. With regards to retro, it is otherwise known as vintage-inspired since it is a style that is derived from those of the past. The term has been used since the 1960’s to describe to new styles that associate with something of the past, but at the same time, it is also being used to categorize styles that have been designed in the past. Retro can be used to refer to a fashion style, art, and even media and cultural themes. You can also read excellent show ticket templates. Lastly, antique refers to an item or style that has been regarded as being very valuable because of its historic significance. According to experts, a style should be at least a hundred years old in order to be considered an antique, though it is almost always used to refer to something very, very old. Among the three, the antique has the highest value considering how old they are, and in terms of items, the value may depend on the item’s quality or condition. You may also see blank ticket templates. Now that you have reached the conclusion of this article, let me ask you, were you able to find what you need? If so, then download your chosen ticket template now. But if you aren’t sure how to do it, here is a brief but concise set of instructions as promised. 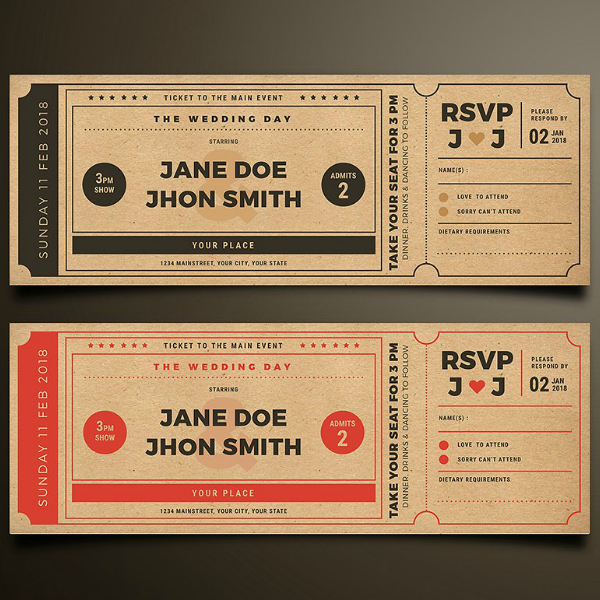 These instructions will not only teach you how to download a printable ticket template, but also how to edit and print them properly in order to pull off an exceptionally stunning vintage-themed ticket. 1. To download a template, the first thing that you will need to do after you have found the template that you need is to click on the button provided below the image. Take note, this will not download the template yet, this button will simply redirect you to the source website of the template. There, you can see more samples and mock-ups of the template to verify if it is indeed the design you want for your tickets. You can also read entrance ticket templates. 2. If the ticket layout template works perfectly for you, click on the Purchase/Buy Now/Download button to start the download process. You will be given the option on what payment method you wish to use, but for some websites, they may require you to register for an account first. Simply follow the instructions provided, and you will be able to finalize the download in no time. 3. After downloading the ticket template, the next thing that you will need to do is edit it according to your preferences. Take note of the template’s format and make sure that you have the appropriate editing tool. To give you an idea, PSD templates should be edited using Adobe Photoshop while AI templates work with Adobe Illustrator. 4. 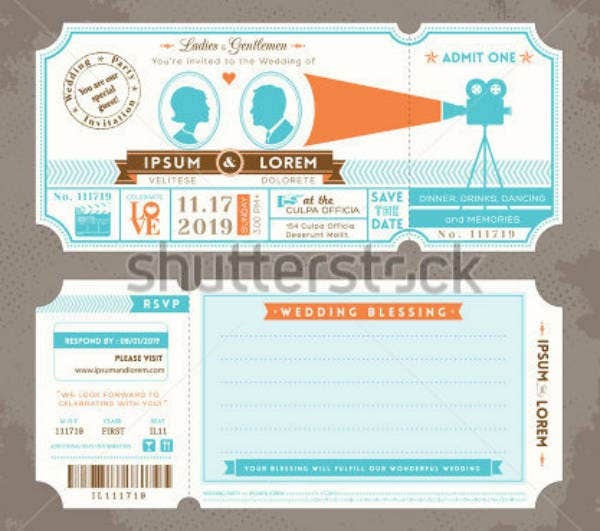 These templates are fully editable as long as you are using the right editing tool, so edit as much as you want, just make sure that your ticket design doesn’t end up looking too cluttered. 5. 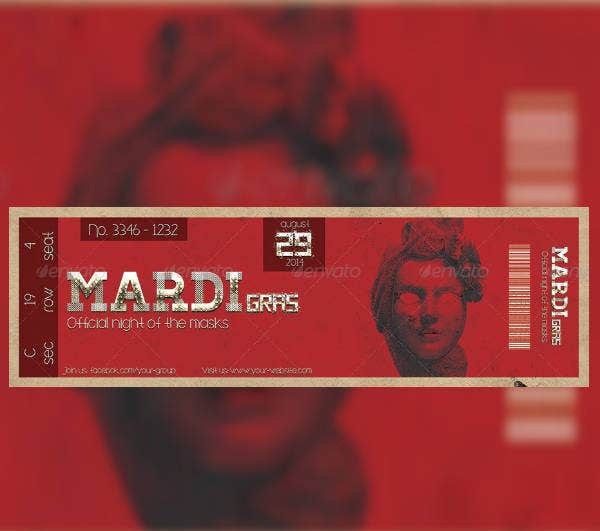 After finalizing the design of the ticket, it’s time for you to have it printed. 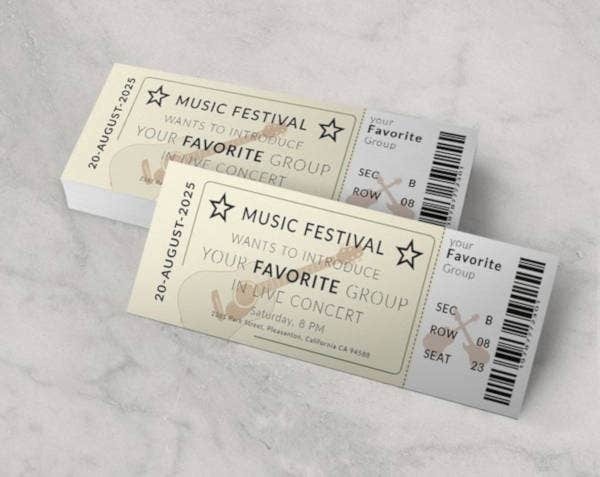 If you choose to print your tickets yourself, make it a point to invest on high-grade paper or stock and ink toner in order to produce high-quality and vibrant-colored tickets. Then again, if you want to save yourself the hassle, you can invest your money on having your ticket design printed in printing companies instead.